Captain Stoutenborough's straps are typical of the period. They are regulation in total dimension and in border width. The border and bars are made of mixed bright and dead bullion. The bars were gold colored and abut the border. The field is medium blue. 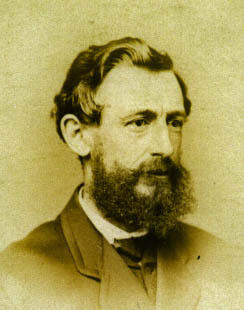 Edwin Augustus Stoutenborough was born October 22, 1828 in New York City. He was commissioned a second lieutenant in the Company A of the 13th (3-month) New York Infantry Regiment and served until the regiment mustered out of Federal service on August 6, 1861. The 13th was stationed in Baltimore and Annapolis, Maryland and guarded railroads leading to Washington. Following his service with the 13th Edwin Stoutenborough received a commission as a second lieutenant in the 90th New York Infantry on October 15, 1862. The unit at the time had already been formed and was stationed in Key West, Florida. We can assume that they needed replacement officers and Stoutenborough was able to secure a commission. He was originally in Company C, but on August 29, 1862 was promoted to be a first lieutenant in Company I. Stoutenborough rise continued becoming captain of Company B on July 23, 1863. The 90th was moved around a fair amount during the war. After their service at Key West, Florida they were moved to New Orleans. They fought at the siege of Port Hudson, Louisiana and Donaldsonville, Louisiana. After an involvement with the Red River Campaign they were moved to Virginia. Here they were part of Sheridan's Valley Campaign and fought at Opeguan, Fisher Hill and Cedar Creek. Following the grand review in Washington they were moved back south and served occupation duties until they were mustered out at the late date of February 9, 1866. Thus few volunteer officers can claim longer service than Stoutenborough. Stoutenborough was laid up for two months with Yellow Fever at Key West, but does not appear to have suffered any major wounds or injuries. I have little information regarding his life after the Civil War, but it is believe that he lived in Brooklyn, New York and applied for a pension in 1891.